Box Text: An All-New Fighting Game from the Creators of the Guilty Gear Series. Challenge the best fighters from around the world Xbox LIVE! Experience Battle Fantasia's world through the eyes of twelve different characters! Unleash deadly asttacks and combinations with Heat Up mode! 06-01-2015 kwisatzhaderach Box Text An All-New Fighting Game from the Creators of the Guilty Gear Series. Challenge the best fighters from around the world Xbox LIVE! 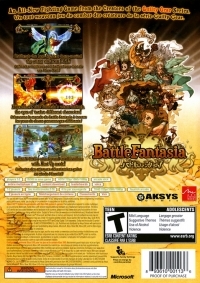 Experience Battle Fantasia's world through the eyes of twelve different characters! Unleash deadly asttacks and combinations with Heat Up mode! 04-10-2013 artikskarab Box Text An All-New Fighting Game from the Creators of the Guilty Gear Series. Challenge the best fighters from around the world Xbox LIVE! 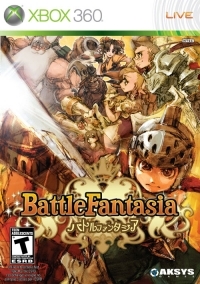 Experience Battle Fantasia's world through the eyes of twelve different characters! Unleash deadly asttacks and combinations with Heat Up mode! 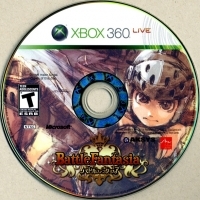 This is a list of VGCollect users who have Battle Fantasia in their Collection. This is a list of VGCollect users who have Battle Fantasia in their Sell List. This is a list of VGCollect users who have Battle Fantasia in their Wish List.